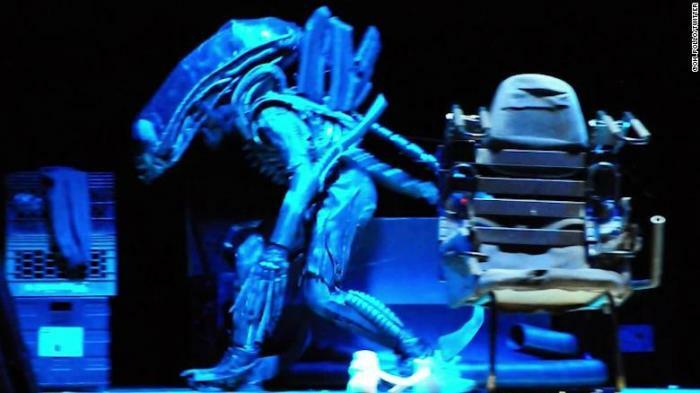 Ridley Scott LOVES “Alien: The Play!” High School Students Turn Classic Horror Into Stage Art! – JR-Sploitation! Home › 70's Films › Ridley Scott LOVES “Alien: The Play!” High School Students Turn Classic Horror Into Stage Art! A group of industrious high schoolers took the classic film from a movie theater and into their high school auditorium! I love this! Even better, clips are showing up from the performance. Well, that would have been a great night of theater! And guess what? There may be more! The film’s Director Ridley Scott is reported to have given the kids high praise and is willing to fund additional performances! Bravo to the kids behind the production: they used their creativity, youthful enthusiasm and passion to create an exciting stage play! So why WOULDN’T someone turn it into a birthday cake? Bravo to the kids at North Bergen High! Sorry, John. I will go back and read it. My bad! Great support and encouragement from Ridley, though I would have expected that from him, as he always seems like a nice guy.